I would like to share a news feature from the US Institute of Peace that discusses a recent visit of a Burmese delegation that we had the honor to host. As part of an ongoing Track II-style dialogue, the Asia Society and the U.S. Institute of Peace (USIP) co-hosted a roundtable in late June that brought together representatives of the Myanmar Development Resources Institute (MDRI), senior advisers to Burmese president Thein Sein, and U.S. experts to discuss the political transition away from authoritarianism in Burma. The meeting continues an informal process launched in January and involving specialists from the United States and Burma to explore opportunities to advance U.S.–Burmese relations. In a short period of time, this Track II collaboration—which brings together, in this case, officials and non-officials for sustained, direct discussions to foster trust and cooperation between the two countries—has developed into a vibrant exchange of ideas and experts between MDRI, the Asia Society and its partners USIP and the Blue Moon Fund. The June meetings provided the Burmese delegation with a better understanding of effective governmental operations, and it established a framework for future USIP work on Burma. A series of further exchanges is planned for the remainder of this year. The most recent session was the culmination of a series of meetings for the Burmese delegation during their trip to Washington and New York, which included attending the June 27 Senate Committee on Foreign Relations nomination hearing for Derek Mitchell, special representative and policy coordinator for Burma, to serve as the first U.S. ambassador to that country in more than two decades. Two days later, Mitchell was confirmed. The Burmese visiting Washington also met with congressional staff members and officials from U.S. government agencies, former White House staff and nongovernmental organizations, including Human Rights Watch and the Open Society Foundations. “As the Burmese government has taken steps over the past year, so too has the United States in an action-for-action approach. Each action we have taken in recent months has had as its purpose to benefit the Burmese people and strengthen reform and reformers within the system,” Mitchell said during his hearing. Having been ruled directly or indirectly by a military government since 1962, Burma returned to quasi-civilian constitutional governance in 2011, freed democracy advocate Aung San Suu Kyi from house arrest, invited her and her party into the parliament via by-elections in 2012 and began to institute wide-scale political, economic and legal reforms. Press restrictions have been eased, and the new parliament, along with President Thein Sein, have become key drivers of reform. In addition, the government and representatives of minority groups are working to resolve differences with minority nationalities and achieve a broader national reconciliation. “The country has expressed an eagerness to rejoin the world community through democratic reform and resolving its internal ethnic conflicts,” says Colette Rausch, director of USIP’s Rule of Law Center of Innovation. In January 2012, recognizing that the challenge of implementing reforms would require considerable international support and assistance, an Asia Society delegation, accompanied by USIP’s Rausch and staff from the Blue Moon Fund, visited Burma to initiate the Track II dialogue with MDRI, a new and independent policy institute based in Yangon. MDRI’s directors provide policy advice on political, economic and legal affairs to Sein. In April a representative from MDRI’s Centre for Economic and Social Development visited Washington for meetings with the Asia Society, USIP and the Blue Moon Fund to lay the groundwork for joint programs on rule of law, constitutional governance and environmentally sustainable development. And earlier in June, the MDRI Centre for Legal Affairs sent a group to Washington for consultations with USIP and the Asia Society on developing programs to support legal reform in those policy areas. 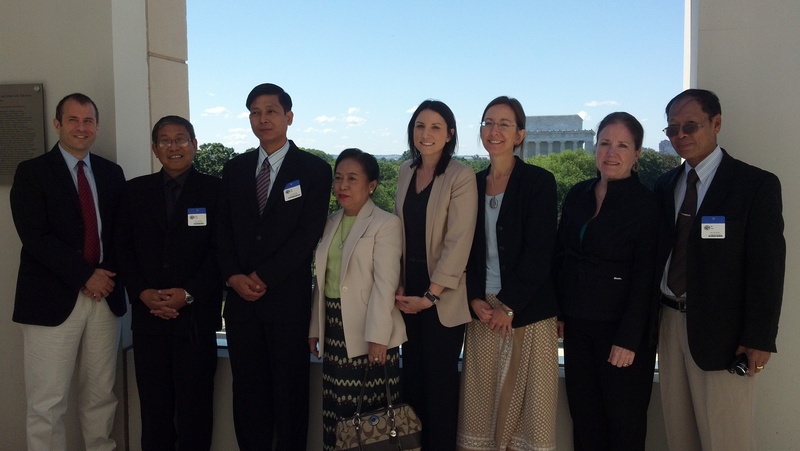 “We look forward to continuing to work in partnership with USIP and the Blue Moon Fund on this Track II initiative with MDRI advisers, including providing advice and assistance on needed reforms identified and led by the Burmese people,” said Suzanne DiMaggio, vice president of Global Policy Programs at the Asia Society.